Chronic inflammation is known to be a risk for many cancers, including pancreatic cancer. Heavy alcohol drinking and cigarette smoking are major causes of pancreatitis, and epidemiological studies have shown that smoking and chronic pancreatitis are risk factors for pancreatic cancer. Meanwhile, inducible nitric oxide synthase (iNOS) and cyclooxygenase-2 (COX-2) are elevated in pancreatitis and pancreatic cancer tissues in humans and in animal models. Selective inhibitors of iNOS and COX-2 suppress pancreatic cancer development in a chemical carcinogenesis model of hamsters treated with N-nitrosobis(2-oxopropyl)amine (BOP). In addition, hyperlipidemia, obesity, and type II diabetes are also suggested to be associated with chronic inflammation in the pancreas and involved in pancreatic cancer development. We have shown that a high-fat diet increased pancreatic cancer development in BOP-treated hamsters, along with aggravation of hyperlipidemia, severe fatty infiltration, and increased expression of adipokines and inflammatory factors in the pancreas. Of note, fatty pancreas has been observed in obese and/or diabetic cases in humans. Preventive effects of anti-hyperlipidemic/anti-diabetic agents on pancreatic cancer have also been shown in humans and animals. Taking this evidence into consideration, modulation of inflammatory factors by anti-inflammatory agents will provide useful data for prevention of pancreatic cancer. 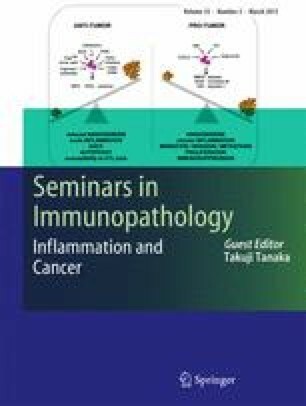 This article is a contribution to the Special Issue on Inflammation and Cancer—Guest Editor: Takuji Tanaka.